On 10 February 2018, when the Sunjuwan Military Station was under a terrorist attack in the early hours of Morning by three heavily armed persons. Master Soumyadip Jana S/O Havildar/Personal Assistant Hari Pada Jana of Army Service Corps was in the residential block with his family. Master Soumyadip Jana without caring for his own safety ensured the safety of his mother & sister by delaying the entry of terrorists into the house. In the process, Master Soumyadip Jana sustained multiple splinter injuries in his head & body which resulted in he being in coma for more than three months. He is still undergoing treatment and recovering but the condition remains critical. He has been operated multiple times. He is unable to move on his own and left side of his body is still paralysed. He also cannot see properly due to left hemi paresis, severe right sided hearing loss and neuro psychotically impairment. Inspite of his young age, Master Soumyadip Jana acted with bravery and saved valuable lives of his family members. 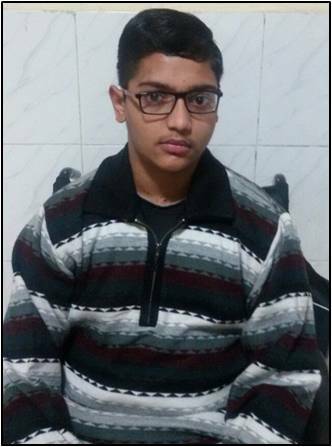 Master Soumyadip Jana is battling the odds in Research & Referral Hospital, Delhi. For his unparalled bravery, unmindful of his own safety, Master Soumyadip Jana has been awarded with NATIONAL BRAVERY AWARD FOR CHILDREN 2018 (Bharat Award) by Indian Council for Child Welfare.